With a dark, almost mystical look to its make, the LARP Rune Spear is perfect for LARP fighters wanting a versatile pole weapon. The spear blade widens into a leaf shape with elegant runes appearing carved down its center surface on a background that has been hand painted to resemble antique brass. 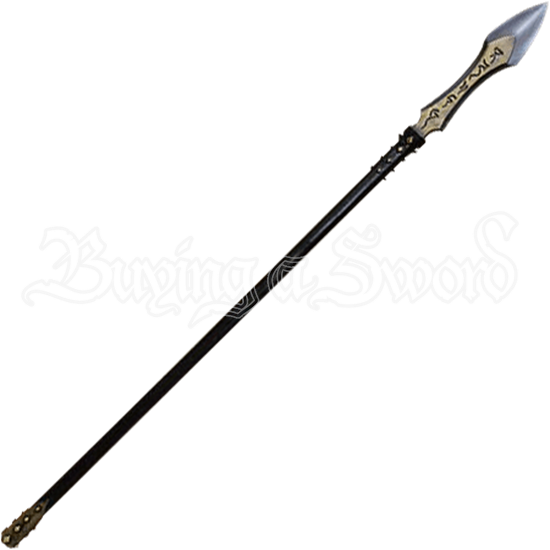 The LARP weapon then transitions to a dark wood-look handle accented at both ends with short, brass tone spikes. Its entire length is made of latex-coated and shred resistant closed cell foam around a flexible and strong fiberglass core. A Kevlar tip adds extra safety to the design. Whether your live action roleplay character is a warrior of dark magic or a soldier from history, this foam LARP spear is the perfect choice. The LARP Rune Spear has an overall length of 74.8 inches. Please be aware that this measurement can vary slightly, as it is a hand-made item.